Vostok Station (Russian: ста́нция Восто́к, translit. Stántsiya Vostók, pronounced [ˈstant͡sɨjə vɐˈstok], literally "Station East") is a Russian research station in inland Princess Elizabeth Land, Antarctica. Founded by the Soviet Union in 1957, the station lies at the southern Pole of Cold, with the lowest reliably measured natural temperature on Earth of −89.2 °C (−128.6 °F; 184.0 K). Research includes ice core drilling and magnetometry. Vostok (Russian for "east") was named after Vostok, the lead ship of the First Russian Antarctic Expedition captained by Fabian von Bellingshausen (the second ship Mirny captained by Mikhail Lazarev became the namesake for Mirny Station). Vostok Research Station is about 1,300 km (≈800 mi) from the Geographic South Pole, at the center of the East Antarctic Ice Sheet. Vostok is located near the Southern Pole of Inaccessibility and the South Geomagnetic Pole, making it one of the optimal places to observe changes in the Earth's magnetosphere. Other studies include actinometry, geophysics, medicine and climatology. The station is at 3,488 metres (11,444 ft) above sea level and is one of the most isolated established research stations on the Antarctic continent. The station was supplied from Mirny Station on the Antarctic coast. The station typically contains 25 scientists and engineers in the summer. In winter, their number drops to 13. 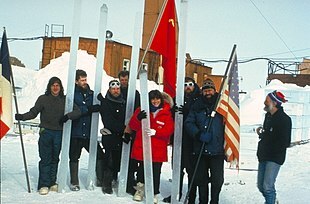 The only permanent research station located farther south is the Amundsen–Scott South Pole Station, operated by the United States at the geographic South Pole. The Chinese Kunlun Station is farther south than Vostok but only occupied during summers. Some of the challenges faced by those living on the station were described in Vladimir Sanin's books such as Newbie in the Antarctic (1973), 72 Degrees Below Zero (1975), and others. Vostok Station was established on 16 December 1957 (during the International Geophysical Year) by the 2nd Soviet Antarctic Expedition and was operated year-round for more than 37 years. The station was temporarily closed from February to November 1994. In 1974, when British scientists in Antarctica performed an airborne ice-penetrating radar survey and detected strange radar readings at the site, the presence of a liquid, freshwater lake below the ice did not instantly spring to mind. In 1991, Jeff Ridley, a remote-sensing specialist with the Mullard Space Science Laboratory at University College London, directed a European satellite called ERS-1 to turn its high-frequency array toward the center of the Antarctic ice cap. It confirmed the 1974 discovery, but it was not until 1993 that the discovery was published in the Journal of Glaciology. Space-based radar revealed that the sub-glacial body of fresh water was one of the largest lakes in the world – and one of some 140 subglacial lakes in Antarctica. Russian and British scientists delineated the lake in 1996 by integrating a variety of data, including airborne ice-penetrating radar imaging observations and spaceborne radar altimetry. Lake Vostok lies some 4,000 meters (13,000 ft) below the surface of the central Antarctic ice sheet and covers an area of 14,000 km² (5,400 sq mi). Vostok Station Tractor: Heavy tractor АТТ 11 which participated in the first traverse to the South Geomagnetic Pole, along with a plaque to commemorate the opening of the station in 1957, has been designated a Historic Site or Monument (HSM 11) following a proposal by Russia to the Antarctic Treaty Consultative Meeting. Professor Kudryashov's Drilling Complex Building: The drilling complex building stands close to Vostok Station at an elevation of 3488 m. It was constructed in the summer season of 1983–1984. Under the leadership of Professor Boris Kudryashov, ancient ice core samples were obtained. The building has been designated a Historic Site or Monument (HSM 88), following a proposal by Russia to the Antarctic Treaty Consultative Meeting. Vostok Station has an ice cap climate (EF), with subzero temperatures year round, typical as with much of Antarctica. Annual precipitation is only 22 millimetres (0.87 in) (all occurring as snow), making it one of the driest places on Earth. On average, Vostok station receives 26 days of snow per year. It is also one of the sunniest places on Earth, despite having no sunshine at all between May and August; there are more hours of sunshine per year than even the sunniest places in South Africa. Vostok has the highest sunshine total for any calendar month on Earth, at an average of 708.8 hours of sunshine in December, or 22.9 hours daily. It also has the lowest sunshine for any calendar month, with an absolute maximum of 0 hours of sunshine per month during polar night. Of official weather stations which are currently in operation, Vostok is the coldest on earth in terms of mean annual temperature. However, it has been disputed that Vostok Station is the coldest known location on earth. 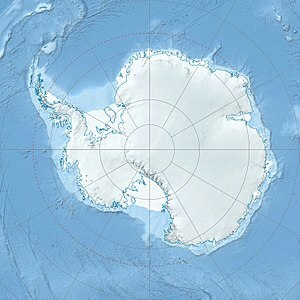 The now inactive Plateau Station, located on the central Antarctic plateau, is believed to have recorded an average yearly temperature that was consistently lower than that of Vostok Station during the 37-month period that it was active in the late 1960s, and satellite readings have routinely detected colder temperatures in areas between Dome A and Dome F.
Vostok is one of the coldest places on Earth. The average temperature of the cold season (from April to October) is about −65 °C (−85 °F), while the average temperature of the warm season (from November to March) is about −42 °C (−44 °F). The lowest reliably measured temperature on Earth of −89.2 °C (−128.6 °F) was in Vostok on 21 July 1983 at 05:45 Moscow Time, which was 07:45 for Vostok's time zone, and 01:45 UTC (See List of weather records). This beat the station's former record of −88.3 °C (−126.9 °F) on 24 August 1960. 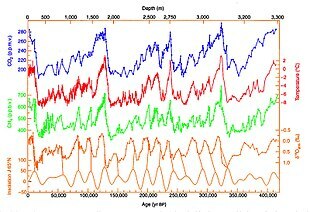 Lower temperatures occurred higher up towards the summit of the ice sheet as temperature decreases with height along the surface. The coldest wind chill was −124 °C (−191 °F) on 24 August 2005 with a real temperature of −74 °C (−101 °F). Though unconfirmed, it has been reported that Vostok reached a temperature of −91 °C (−132 °F) on 28 July 1997. The warmest recorded temperature at Vostok is −14.0 °C (6.8 °F), which occurred on 5 January 1974. The coldest month was August 1987 with a mean temperature of −75.4 °C (−103.7 °F) and the warmest month was December 1989 with a mean temperature of −28 °C (−18 °F). An almost complete lack of moisture in the air. An average windspeed of 5 metres per second (11 mph; 18 km/h), sometimes rising to as high as 27 metres per second (60 mph; 97 km/h). The lack of oxygen in the air because of its high elevation at 3,488 metres (11,444 feet). A higher ionization of the air. Acclimatization to such conditions can take from a week to two months and is accompanied by headaches, eye twitches, ear pains, nose bleeds, perceived suffocation, sudden rises in blood pressure, loss of sleep, reduced appetite, vomiting, joint and muscle pain, arthritis, and weight loss of 3–5 kg (7 lb–11 lb) (sometimes as high as 12 kg (1 st 12 lb)). In the 1970s the Soviet Union drilled a set of cores 500–952 m deep. These have been used to study the oxygen isotope composition of the ice, which showed that ice of the last glacial period was present below about 400 metres' depth. Then three more holes were drilled: in 1984, Hole 3G reached a final depth of 2202 m; in 1990, Hole 4G reached a final depth of 2546 m; and in 1993 Hole 5G reached a depth of 2755 m; after a brief closure, drilling continued during the winter of 1995. In 1996 it was stopped at depth 3623 m, by the request of the Scientific Committee on Antarctic Research that expressed worries about possible contamination of Lake Vostok. This ice core, drilled collaboratively with the French, produced a record of past environmental conditions stretching back 420,000 years and covering four previous glacial periods. For a long time it was the only core to cover several glacial cycles; but in 2004 it was exceeded by the EPICA core which, whilst shallower, covers a longer time span. In 2003 drilling was permitted to continue, but was halted at the estimated distance to the lake of only 130 m.
The ancient lake was finally breached on 5 February 2012 when scientists stopped drilling at the depth of 3,770 metres and reached the surface of the sub-glacial lake. The brittle zone is approximately between 250 and 750 m and corresponds to the Last Glacial Maximum, with the end of the Holocene climatic optimum at or near the 250-metre depth. Although the Vostok core reached a depth of 3623 m the usable climatic information does not extend down this far. The very bottom of the core is ice refrozen from the waters of Lake Vostok and contains no climate information. The usual data sources give proxy information down to a depth of 3310 m or 414,000 years. Below this there is evidence of ice deformation. It has been suggested that the Vostok record may be extended down to 3345 m or 436,000 years, to include more of the interesting MIS11 period, by inverting a section of the record. This then produces a record in agreement with the newer, longer EPICA record, although it provides no new information. ^ "Vostok Skiway". Airport Nav Finder. Retrieved October 17, 2018. ^ a b Winchester, Simon (2003). Extreme Earth. Collins. pp. 168–169. ISBN 0-00-716392-4. ^ "Mirny Observatory". 14 July 2018. ^ "Russia abandons Ice Station Vostok". 4 March 2003 – via news.bbc.co.uk. ^ a b "Deep drilling at Vostok station, Antarctica: history and recent events" (PDF). ^ Oswald, G. K. A.; Robin, G. de Q. (1973). "Lakes beneath the Antarctic Ice Sheet". Nature. 245 (5423): 251–254. doi:10.1038/245251a0. ^ Dieter Fütterer; Georg Kleinschmidt (2006). Antarctica: contributions to global earth sciences : proceedings of the IX International Symposium of Antarctic Earth Sciences Potsdam, 2003. Birkhäuser. p. 138. ISBN 978-3-540-30673-3. Retrieved 30 July 2010. ^ "List of Historic Sites and Monuments approved by the ATCM (2012)" (PDF). Antarctic Treaty Secretariat. 2012. Retrieved 2013-10-26. ^ "List of Historic Sites and Monuments approved by the ATCM (2013)" (PDF). Antarctic Treaty Secretariat. 2013. Retrieved 2014-01-09. ^ a b "Vostok Station". Antarctic Research and Investigation. Retrieved June 16, 2015. ^ "Where are the World's Sunniest Destinations?". 24 June 2011. ^ a b "Monthly values of meteorological parameters, Vostok station (89606)". Antarctic Research and Investigation. Retrieved June 12, 2015. ^ a b "World: Lowest Temperature". Arizona State University. Retrieved June 16, 2015. ^ Budretsky, A.B. (1984). "New absolute minimum of air temperature". Bulletin of the Soviet Antarctic Expedition (in Russian). Leningrad: Gidrometeoizdat (105). ^ Budretsky, A.B. (1984). "New absolute minimum of air temperature (English Version)". Bulletin of the Soviet Antarctic Expedition. Leningrad: Gidrometeoizdat (105). ^ Liang, Yong Li (2000). "Coldest Temperature On Earth". The Physics Factbook. Retrieved 2007-09-02. ^ "Sunrise and sunset times in Vostok Station, May 2015". www.timeanddate.com. ^ Lipenkov VY, Salamatin AN, Duval P (1997). "Bubbly-ice densification in ice sheets: 11. Applications" (PDF). J. Glaciol. 43 (145): 397–407. ^ Vostok Ice Core Data www.ncdc.noaa.gov, 2005-12-22. Retrieved 2007-03-27. Wikimedia Commons has media related to Vostok Station. Lake Vostok is the largest of Antarctica's almost 400 known subglacial lakes. 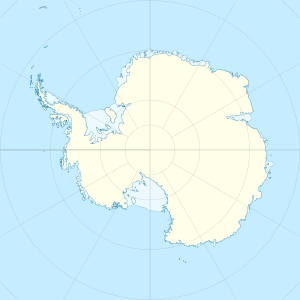 Lake Vostok is located at the southern Pole of Cold, beneath Russia's Vostok Station under the surface of the central East Antarctic Ice Sheet, which is at 3,488 m (11,444 ft) above mean sea level. The surface of this fresh water lake is approximately 4,000 m (13,100 ft) under the surface of the ice, which places it at approximately 500 m (1,600 ft) below sea level. Lake Vida is a hypersaline lake in Victoria Valley, the northernmost of the large McMurdo Dry Valleys, on the continent of Antarctica. It is isolated under year-round ice cover, and is considerably more saline than seawater. It came to public attention in 2002 when microbes frozen in its ice cover for more than 2,800 years were successfully thawed and reanimated. A subglacial lake is a lake under a glacier, typically an ice cap or ice sheet. There are many such lakes, with Lake Vostok in Antarctica being by far the largest known on Earth at present. Komsomolskaya was a Soviet Antarctic inland research station founded in 1957 in Queen Mary Land, in eastern Antarctica. It was a year-round station till 1959, then used as a seasonal outpost till 1962 when it was shut down permanently. Nonetheless it is still used as a fuel storage stop for supply caravans en route from Mirny Station to Vostok Station. Andrey Petrovich Kapitsa was a Russian geographer and Antarctic explorer, discoverer of Lake Vostok, the largest subglacial lake in Antarctica. He was a member of the Kapitsa family, a scientific dynasty in Russia.